This is one of those letters that I never thought I would write. I don’t mean this in a bad way. I actually shock myself when I say, “It is a good thing that I am writing this letter.” Let me back up and explain what this letter is all about. As a young man growing up in the 1980s and becoming a young adult in the 1990s you, AOL, have touched and effected my life on many levels. If it was not for the hundreds of discs you mailed me, my college apartment in Chico would not have had any coasters for beers. 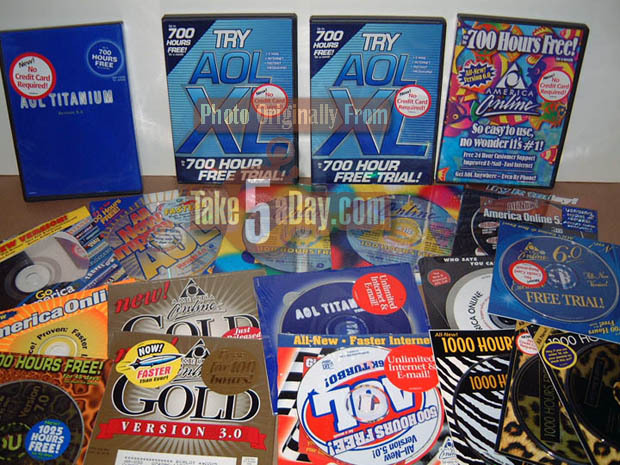 If it was not for you, AOL, I would never had played the beer drinking game “AOL Card House.” When we couldn’t find playing cards, we built a house of AOL discs. If it was not for you, AOL, I never would have entered that chat room and met that 22-year-old Swedish fashion model, with whom I had adult conversations (I wonder if she ever received that cashier’s check I sent her for that investment?) And, I should go on record that if it were not for you, I would not be where I am today. Truly, I mean it. It was with you that I first got online, found content, and became networked. Then you and I, AOL, went our separate ways. You wanting me to just spend time with you and your own content, making me dial in. You tried to keep me trapped. I was not ready for a serious, committed relationship. I had to learn that another whole online world was out there… DSL, websites, content from other places. I had to end our relationship and go on without you. I had to find myself. You are going places and putting yourself out there. It seems you have an iPad application called Editions. I really like it, and I’m using it daily. You listen to me now. I emailed your Editions peeps and Sol L. responded to me directly. On a Saturday! You seem to communicate better. Sol L. actually emailed me to let me know Editions was back up. You care about my family and friends. It’s just not all about you anymore. I find myself reading my local San Carlos and Redwood City Patch. It seems Patch is owned by AOL. You take interest in what I like. You even own the Huffington Post now. So, let me continue to be honest. I still make jokes at your expense when you’re not around. This said, I have a new respect for you. I just hope your attempt at trying to save our relationship is not just a little too late. I want you to know that I’m willing to work on it…if you are. Last week I did a post about “What Is The Must Have Gadget For Xmas 2010?” Though I thought it might be something else, it was hands down the iPad. So, you want mey to give away free iPad… I will giveaway a free iPad! Hey, I listen! Step 1: Between November 16 and December 15, 2010 download and install Meshin. Step 2: Use it for at least one week. Step 3: Then email us at feedback@meshin.com with the subject: iPad with two pieces of either feedback, comments, or ideas. Yep that is it. Pretty easy huh? So you can take that $500 you would of spent on the iPad and put it towards apps, videos, books and music. I aim to please! What Is The Must Have Gadget For Xmas 2010? I’m talking about what gadget/toy/tech do you pine for? It is something you would jump through hoops, beg, steal or borrow to get it. I really need your help in figuring out what is the ultimate gadget for 2010. This is just a short list that I came up with. Is there something I am missing?